The GCI Verification IP is compliant with 1.3 specifications and verifies GCI interfaces of designs GCI Interface. It can work with SystemVerilog,Vera, SystemC, E and Verilog HDL environment. 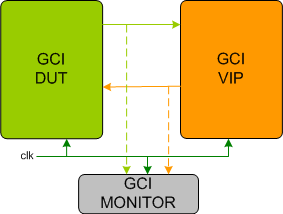 GCI VIP is developed by experts in networking, who have developed networking products in companies like Intel, Cortina-Systems, Emulex, Cisco. We know what it takes to verify a networking product. Follows GCI specification as defined in GCI specification v1.3. Per lane skew insertion to test lane alignment. Supports very flexible way to test sync and alignment for state machines at startup. Supports CID and Idle/Pause frames. Supports breaking of frames into sub-frames. Complete functional coverage for both normal and error cases. GCI verification IP comes with complete testsuite to test every feature of GCI specifications. SmartDV's GCI Verification env contains following. Complete regression suite containing all the GCI testcases.